Modern turbocharged petrol engines have been breaking barriers for a while now. If anyone proposed just a decade ago that you can have remarkable fuel efficiency, next to no CO2 emissions and great power from an internal combustion engine, many would say you could not have your cake and eat it too. 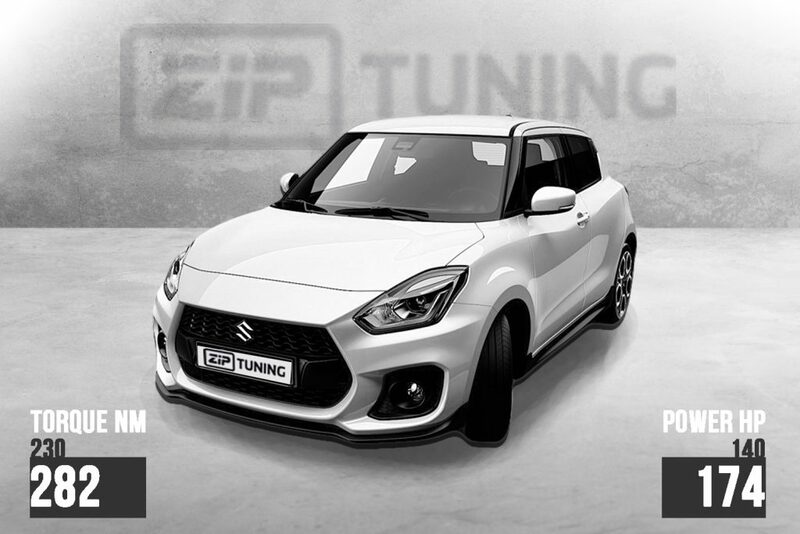 However, the latest Suzuki Swift Sport tuning proves that it is possible. The small 1.4 BoosterJet, after our expert OEM ECU Bosch MED17.9.63 tuning, produces 174 hp and 282 Nm of torque. It may not sound massive at first sight, but a car of its size with such a small engine is a real beast with 174 hp and torque delivered even in lower revs. Its compact dimensions and low weight make is incredibly agile and fun on twisty roads and this customer of ours is a person who definitely knows how to appreciate it and make the most of the potential. The Suzuki Swift Sport is obviously aimed at giving you hot hatch fun for a reasonable price. The K14C BoosterJet engine has the displacement of only 1.4 l but packs some serious punch for sporty moments as well as great everyday usability thanks to a host of features such as turbocharger, advanced lightweight materials and tech solutions such as VVT, wastegate and injectors with 6-hole nozzles. All these things combined translate to remarkable fuel efficiency in peaceful city driving and great fun with the pedal to the metal. Speaking of fun, the stock car produces 140 hp and 230 Nm of torque, the later available from 2500 RPM. The Suzuki Swift Sport tuning is aimed at giving all that but at a higher level. 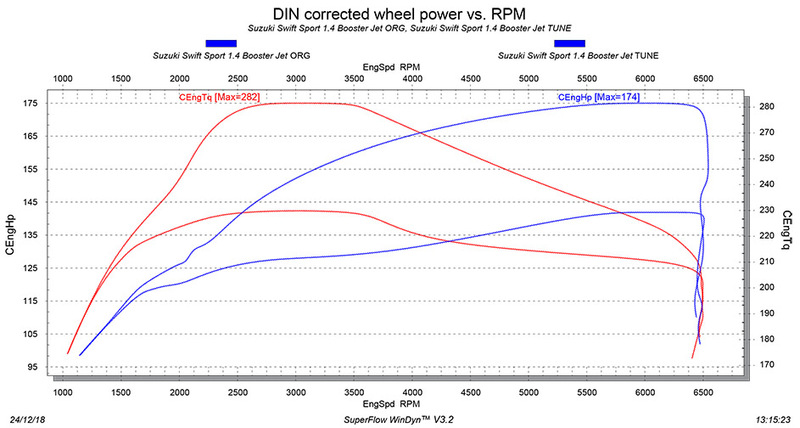 This makes a great basis for Suzuki Swift Sport tuning performed by our expert engineers. As the subtitle says, the entire tuning process for our Stage 1 Swift Sport tuning comes from our Bosch MED17.9.63 tuning – a software modification that results in the described power gains. The OEM ECU controls operation of the K14C engine and enables us to safely and efficiently modify the output. The first step in this modification is an increase in the amount of air that the engine is fed. This is done by increasing the turbo pressure. This increase does feed more air into the cylinders, but it also disrupts the air-fuel ratio. This is why we need to bring it back to perfection by an adjustment in fuel delivery. The efficient injectors mean the world to us in this respect, since they allow precise adjustment that is also completely safe. Most of the top power and torque figures gains come from the above modifications. However, before we perform the final measure of the improvement, we need to do another thing. The thing is an advancement of injection timing. It does not do much for the increase of the top power figure, but it makes a much wider torque curve and it greatly improves throttle response. That means that you can use the torque over a wider RPM range and the reaction time of the car with you press the pedal is greatly reduced. It is very important to note that all of these steps have to be carefully monitored in order to ensure that the vehicle is safe after tuning. For example, going too far with turbo pressure increase and following it with a more generous fuel delivery can create pressures or temperatures that are above the level that the stock parts can endure. This is why knowing the limits of these parts is essential. The same goes for meticulous measurements on top-notch equipment that give us reliable information about the levels of stress that the parts are enduring. This is the only way to make sure your tuning is efficient, safe and reliable! Similarly, advancing ignition timing too far can cause serious engine malfunction, so measuring the adjustments and knowing how far we can safely go enables us to tune every car to its max without jeopardizing safety. If you are in need of more elaborate adjustments, then we need to change some parts and use the ones that can endure higher levels of stress. This can result in massive gains in power and it constitutes higher levels of tuning that our expert engineers also offer. However, for the Stage 1 alone that we are presenting here, we only adjust the software for the OEM ECU MED17.9.63 tuning. The resulting power and torque figures come to 174 hp and 282 Nm of torque. Moreover, by following the OEM software architecture, we ensure that the power and torque curves resemble the stock ones and provide the wide range drivability of the stock car, just at a much higher level. It is also very important to note that the same engine is used in the Suzuki SX4 S-Cross and the Suzuki Vitara. Being able to tune this engine in the Swift Sport also means we are able to tune other vehicles with the same as well. If you are looking for a reliable tuning partner, ZIP tuning is here for you!